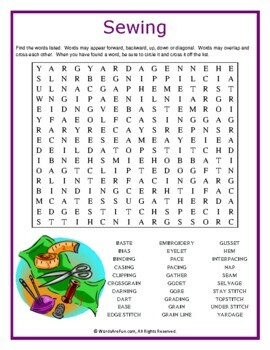 A word search puzzle featuring words associated with sewing. This word search puzzle can never be as fun and rewarding as the real thing.. . . or can it? Use this sheet as part of your teaching curriculum, a treat for early finishers or just for fun. Word List: Baste, Bias, Binding, Casing, Clipping, Crossgrain, Darning, Dart, Ease, Edge Stitch, Embroidery, Eyelet, Face, Facing, Gather, Godet, Gore, Grading, Grain, Grain Line, Gusset, Hem, Interfacing, Nap, Seam, Selvage, Stay Stitch, Topstitch, Under Stitch, Yardage.